Over the past week, thirty-four of our Extraordinary Ministers of Holy Communion participated in the annual formation workshop. We reflected upon the participation on everybody in the liturgical celebration. The Mass is the celebration of Christ and his Church – the Church present at this time and place, united in prayer and faith with the Church universal and those gone before us marked with the sign of faith. We will discuss these qualities in greater detail in the coming weeks. 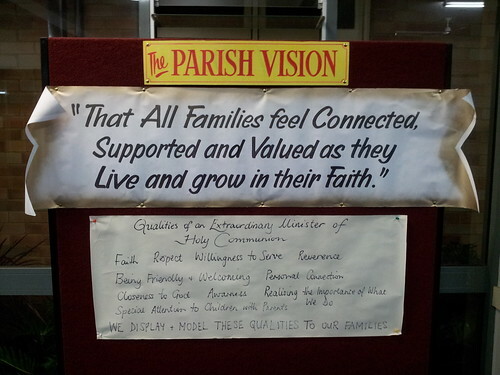 We also considered how these qualities, displayed and modelled by our ministers (and hopefully by all our parishioners), allow us to contribute in a small way to the realisation of our parish vision that all families feel connected, supported and valued as they live and grow in their faith. That is why you will find some of our discussion recorded and displayed on our parish vision board in the narthex today. During October, our Extraordinary Ministers of Holy Communion participated in their annual formation workshops. This week, we are taking a moment to remind you of a few important matters we raised at the workshops. The Breaking of the Bread and other preparations at the altar for communion are undertaken by the priest, assisted as required by acolytes and servers. The Extraordinary Ministers move forward to the altar to receive communion once the priest receives communion. The Extraordinary Ministers distribute communion, holding up the host or chalice before each communicant and saying “The Body of Christ” or “The Blood of Christ” respectively. Other words such as “Receive…” or “This is…” are not permitted, as these change the meaning of what is being said. Once communion is finished, the Extraordinary Ministers return the Eucharistic vessels to the credence table and return to their seats immediately. Extraordinary Ministers are not to consume any remaining consecrated wine or purify (rinse out) chalices. This will be done after Mass in the sacristy. The assistance of all Extraordinary Ministers is required after Mass to ensure that patens, chalices and cruets are washed and put away in the correct locations, and that linen is placed in the laundry basket. This only requires about five minutes of your time.